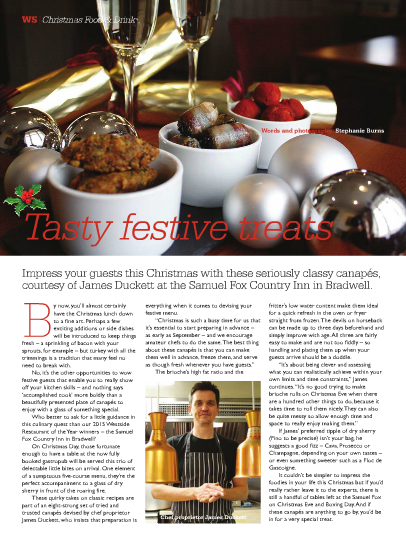 Since James Duckett took over as the chef/proprietor of the Samuel Fox Country Inn in October 2012, there have been a number of excellent reviews, for example in December 2012 in the Sheffield Telegraph, in the April 2013 edition of Profile Magazine on pages 56-58 and in the December 2013 issue of Westside Magazine and again, more recently in the August 2014 issue. An excellent food blogger review in May 2014 was followed by a further review in the Sheffield Telegraph in June and in September 2014 one of James’s then current dishes was featured in the same paper. 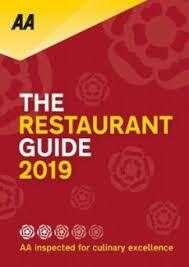 In February 2015 a review of the restaurant appeared in the Peak District publication, Pure Buxton and in July 2016 in the sister publication, Pure Bakewell. In the 2015 Christmas issue of the Sheffield Westside Magazine there's a three page spread (pages 100-103) featuring some of James's festive canapes recipes and in the March 2016 issue of the same magazine there is a further review of James's food (page 81). A more recent review in the Sheffield Telegraph was published online in May 2016. 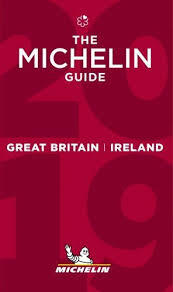 Our restaurant is recommended in the AA Restaurant Guide (two rosettes), AA Pub Guide, Good Food Guide (score four), Hardens Best UK Restaurant Guide (score 13/15), Michelin Restaurant Guide, Michelin Eating out in Pubs Guide, the Good Pub Guide in which it is commended for the quality of it's food and wine offers. 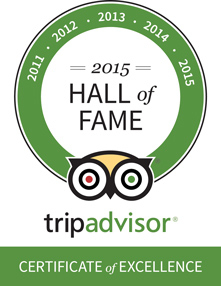 It was named ‘best newcomer’ in the 2014 Derbyshire Food and Drink Awards, has a Taste Derbyshire Gold Award for quality and has held a Certificate of Excellence from the customer review site TripAdvisor for seven continuous years from 2011 todate for which the Samuel Fox has become a member of Tripadvisor's Hall of Fame. 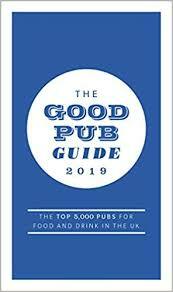 In June 2015 the Samuel Fox was a double winner in the Sheffield Westside Restaurant of the Year Awards, picking up Best Pub Restaurant and overall Restaurant of the Year awards. 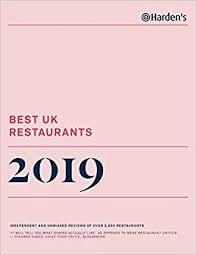 In June 2017 we did it again, this time scooping Best Contemporary Restaurant and overall Restaurant of the Year awards. 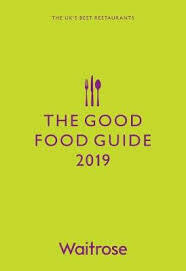 If you have enjoyed a meal at the Samuel Fox why not post a review on line with TripAdvisor, The Good Food Guide and Harden's Guide? Just click on the icons below and follow the on page directions.